Indian and French navies have conducted final and third phase of Varuna naval exercise 2018 near Reunion Island in Indian Ocean region (IOR) from 1-7 May 2018. It is a seven-day exercise which includes different scenarios, including air defence, firing, manoeuvers, asymmetric warfare and embarkation. The current exercise includes the participation of two major vessels of the Indian Navy, the destroyer INS Mumbai and the frigate INS Trikand. 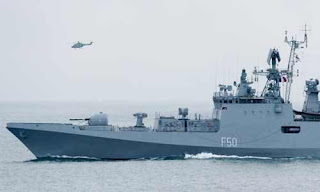 The Varuna exercise is part of a long-term bilateral cooperation with India. It was recently reinforced by the document on the Joint Strategic Vision of India-France Cooperation in the Indian Ocean Region. The document was signed during the state visit of President Emmanuel Macron on March 10, 2018. The first phase was held in Arabian Sea, second phase was held off the Chennai coast in Bay of Bengal and third phase was held near France’s Reunion Island in South. Question 2. “Harimau Shakti” exercise was recently held between which two countries? Question 3. Who is the Chief of the Naval Staff (India)?